I was slacking off on my update so I am combining my week 16 and 17 update. Yes, yes I know. I should post an update once a week, but life gets in a way and between my training, my job and being a mom – I have a very little time left. So I choose to nap instead of writing my update. Heh. There’s not much to report for this week. Remember when I twisted my ankle during my 17 miles run? Yeah, that turn out bad. It sprained my ankle quite a bit and in result, I have a swollen ankle for a while and my shins were paying the price. My physical therapy ordered me to stay off my feet and not do any run at all. So the only run I did this week was the one before I saw my physical therapist. I went out to Seattle Waterfront and did 3 miles with Ryan Malcom (t). That was actually pretty painful run. I didn’t realize my ankle was in that bad of the shape (literally) and my shins were screaming in pain the entire 3 miles. I spent an hour on elliptical machine on Thursday as well as Saturday. In between, I tried to do some walk, but I literally limp around so I skipped them. My stubbornness really carry me over to the stupid line, I guess. Lesson learn here – when you twist your ankle in mile 1 – do NOT continue running another 16 miles. Got it. Big week. I saw my physical therapist on Monday and she cleared me for easy run on the treadmill. I was antsy. I haven’t run for almost a week and just want to get out and run. Wow. I never thought I actually said that. I never considered myself a runner, until recently. I never felt antsy for not able to run. I usually get antsy for not able to go out and hike for a while. Anyway, I ran 3 miles on Tuesday and Thursday. At the treadmill. I did okay. Shins were still tender, but ankle was better. On Friday, my PT cleared me for my long-run with a big warning to be very, very careful and to listen what my body told me. I was excited, until Saturday morning came along. It was COLD morning. About 37 degrees. No rain, but it was definitely wet in the trail. Oh, did I mentioned COLD? I really didn’t want to go outside, let alone run 20 miles but most of my friends already know I’m going to do this, and I just can’t face them if I didn’t go out. Accountability. I’m tellin’ ya. It really does work. So here I was. On 37 degrees Saturday. Out on the trail. I wore my base layer, my Portland Half-Marathon short sleeves shirt, and my running jacket. On the bottom, I have my capri and wore my compression sleeves. Plus the gloves. I was ready. I started the run with fairly slow pace. My PT told me to run 2 minutes slower than my normal pace which I had no problem to do so. I ran the first 6 miles or so with Jimmy May (t) and I just love his company! That was awesome. 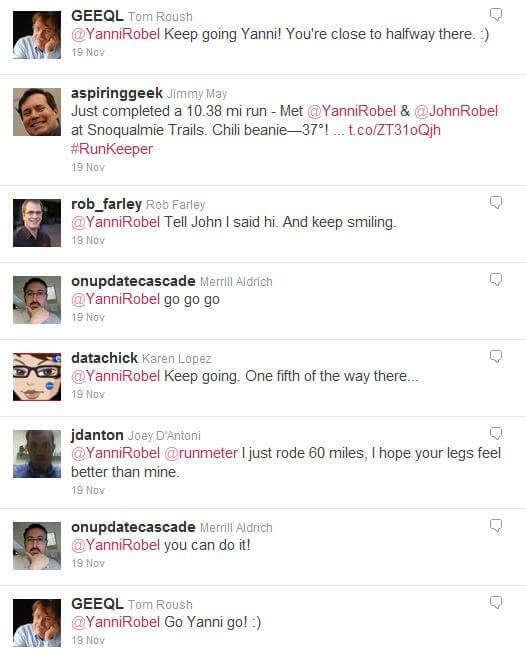 There was one tweet after another John tweeted that, and that’s even after many-many encouraging tweets I had during the run. I’m telling you, I have a really awesome friends who are so supportive on things you do! I finally finish the 20 miles and was never been so happy to see our car in the parking lot! John had brought me my parka jacket, the jacket that I used for my climbing as I was immediately shivering when I stop running. I stretched, drank more water and ate some banana and we head home. 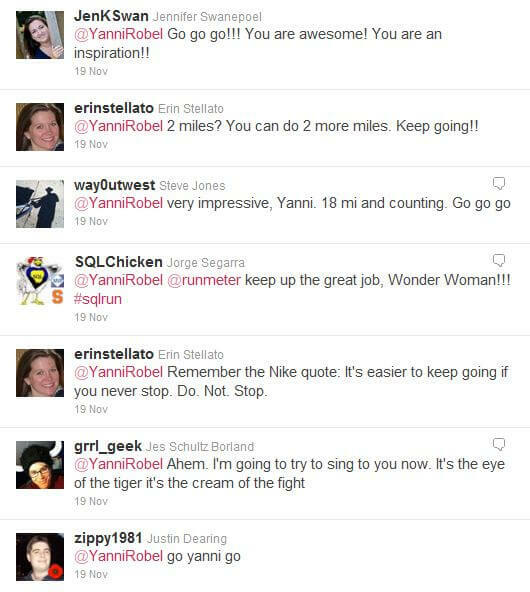 For those who were there for me on during my run, and continuously sent out encouraging tweets and Facebook messages. From the bottom of my heart, thank you. Very, very much. It meant a lot to me. I know some of you can vouch for this too. That was what kept me going. 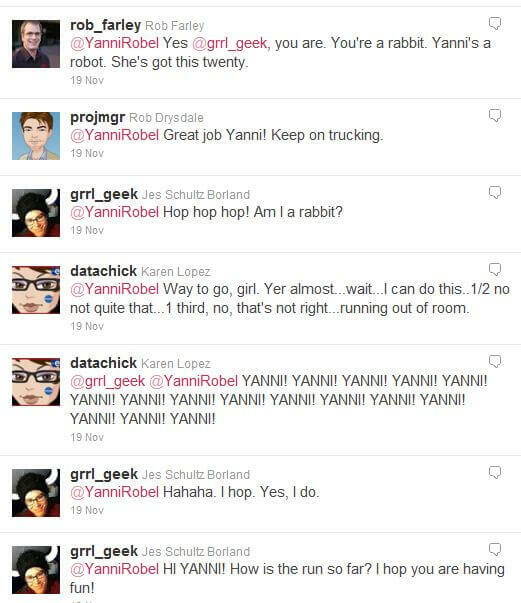 Some of them made me giggle, and some of them made me burst into laugh. 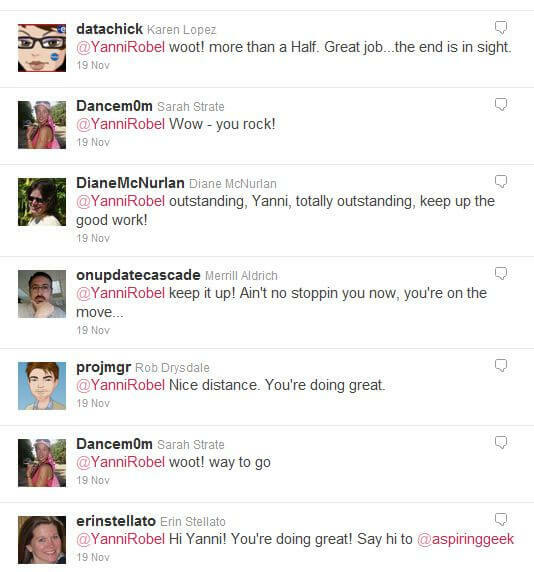 Some of them ticked me off and lit fire under my behind, but all of those tweets help me in their own way. I love them. Below are just some of them that I can capture. It’s so awesome and I am so thankful to have this many support. Just look at these tweets below. They are really, really great. Not much going on here as I haven’t done much. I sent out first email and got some donation out of it. I need to start kicking into a high gear. My race is 6 weeks away. If you happen to read my post all the way to this point, please visit my fundraising page at http://tinyurl.com/RobelMarathon. Every dollar mean a lot. Beside – what are the better ways to try to get tax deductible, right? End of year is around the corner and your donation is 100% tax deductible. And you are helping ME. And thousand of others who are affected with blood cancer. Thomas LaRock (t) assignment for Meme Monday November is about SQL Family. When I saw the topic, I knew that I had to jump on the bandwagon and write something about this because this topic holds a dear place in my heart. As most of you already know, I have had some health challenges in the past few years. 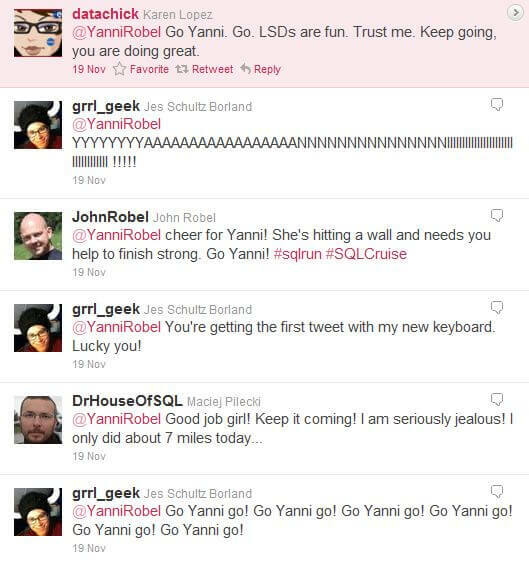 Earlier last year, I was starting to get more involved in the SQL community. 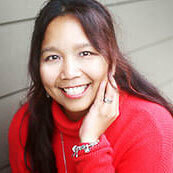 I joined Twitter and started to get to know people in the community, both virtually and in person. I was amazed at how generous people in this community are with their time on helping others and sharing their knowledge! I got hooked with #sqlhelp hash tag where I can pick a lot of smart peoples brains whenever I stumbled into a challenge and the highlight for me, was during summer 2010, when I attended the maiden voyage of SQL Cruise. Not only did I learn a lot from that event, I made some really great friendships with some of the attendees. Shortly after the cruise, my health faced a new challenge and I had to undergo three weeks of hell difficult procedures. The support I received from this community was completely above and beyond any expectations. I had constant emails, tweets and messages from many of people in the community that lifted my spirit, gave me hope, and helped me through some tough times. They sent me jokes to cheer up my day, made me laugh and some of them (you know who you are) sent a broadcast of prayer requests on my behalf. Please note – I never met some of these people, and some of them, I only met them once in person! Earlier this year, I was blessed with good news in my health and I decided that I wanted to go back to my mountain. I had a new goal and started to train for it. 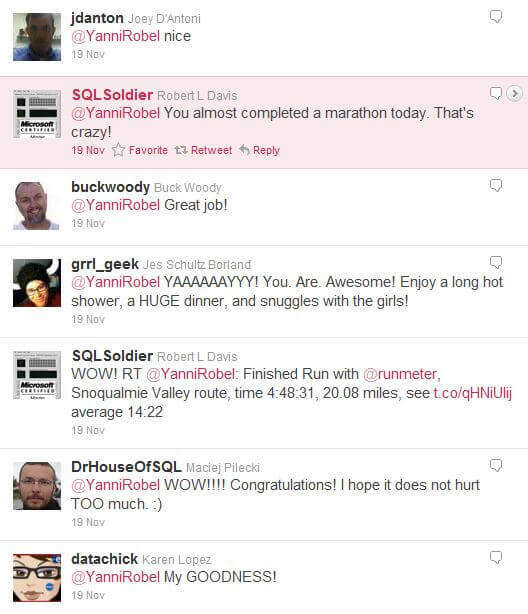 I mentioned my goal of summiting Mt Rainier on Twitter and the support I had from the SQL community, again, was completely awesome and a little unexpected. On the rough day that I just didn’t feel like doing my work out or hike, I had countless encouraging messages, tweets and even phone calls from people on this community! They (again) lifted my spirit! The day of my climb, I had so many people monitor my progress. I carried a GPS that transmited my location on the mountain and marked the map so people can see where I was. It was completely overwhelming the support that this community, this family gave me. Then there’s my wedding. I had special table (the Denali table) just for my SQL People during our reception. Some of them flew across the country just to attend our wedding! I was honored, and touched. 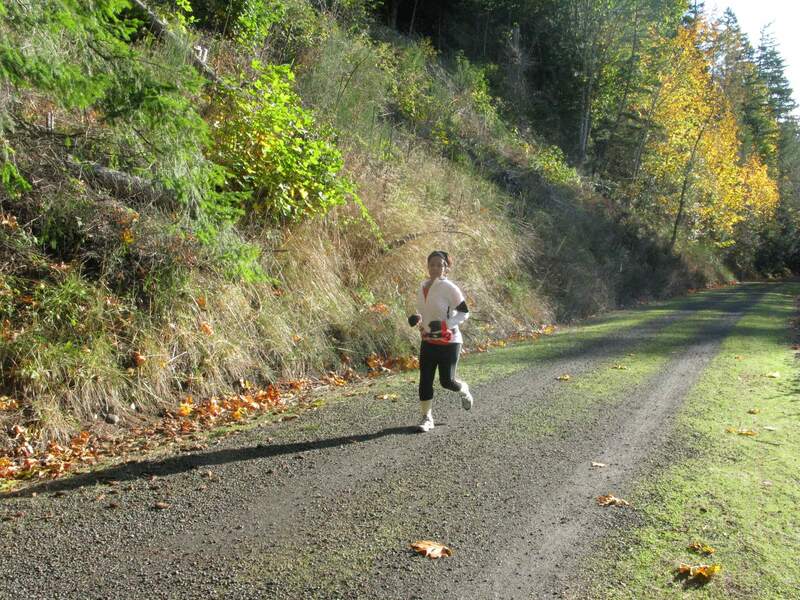 Then there’s Portland Half-Marathon. I wrote a post on its own about this here and Karen Lopez (t) wrote a beautiful recap here. It’s beautiful. It’s awesome. It’s very real. To summarize — this community, this SQL community is more than just a community for me. 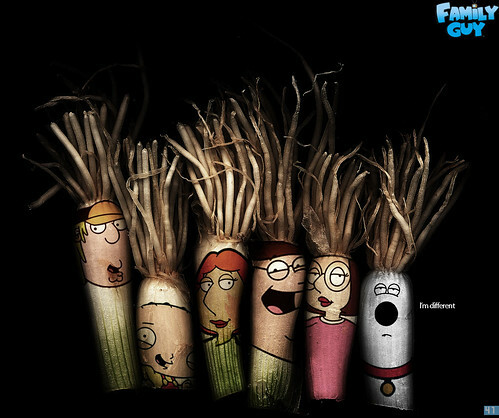 They are my extended family. They are there for me, not just during a good times, but through my challenging times. Not just when I can’t figure out which index is slowing down the site, but when I am struggling to live life. I love these people. Thank you. Thank you for being such an awesome bunch. I am going to start this post by ranting a little bit. This is still fresh in my mind so I want to get it out there. I ran into my someone I know earlier and he asked me how my Portland Half went. I said — it was awesome! Then he asked me about my time. I answered proudly – 2 hours 46 minutes. He gave me this look and continued said – wow, that’s pretty slow. Did ya walk it? I was in shock and completely speechless with that comment. I didn’t even know what to say and almost mumble and try to justified my time, but then I quickly become mad. Really, really mad. My tears started to welled up in my eyes and to avoid any awkward situation, I made up some excuse and walk away. Then I got even more mad. I worked really really hard for my half and I am proud with my accomplishment. My time might not be the most awesome one for others, but it was for me and to have the nerve to ask if I walked it, that just plain rude. I did the course. It doesn’t matter if I run it, walk it, or run/walk it. I did the whole 13.1 miles. The entire thing! I am surrounded by awesome people around me and sometimes I forget that there are rude and not nice person out there. The one that like to question your accomplishment and put you down for all the hard work you did. I let that kind of person get to me and question my own accomplishment. Even for a few seconds! Allright, enough ranting. I feel better. I mentioned this incident to my #sqlrun ladies and I love that they are angry for me. Thank you for being a continuous supporter for me. Big day. It took me over two hours from the moment I got up to the time that I actually laced my running shoes. It didn’t really want to go out and run. It was a 35 degrees morning! Facing with the thought of having to explain to my #sqlrun peeps on why I didn’t do my run, I sucked it up and hit the trail. I started with a steady pace, a bit slower than normal. Thanks to my new Zensah Compression Sleeves, my shins felt really good and I didn’t even feel any pain on it. It was beautiful on the trail. The ground covered with orange leaf and it was absolutely stunning. Before long, I hit the first mile and shortly after, I stepped on slippery rock under the leaf and as I balance myself, I twisted my ankle really bad. The sharp pain shoot from my ankle towards my hips. I let out a big yelp, stopped and hunched over. I was supposed to run 17 miles!! I started walking, tried to shake the pain and continue running. I slow down my pace and felt okay in my ankle so I kept on going. Around mile 8, I started to feel some shooting pain again, and as I was trying to asses what it was, I tripped over a branch on the trail and almost fell! Fortunately, I regain my balance right away and didn’t injure myself in the process. I kept on running. I managed to get my focus back and maintain my pace. Around mile 11 – I felt the same shooting pain and I almost lost it. I was frustrated. I had 6 miles to go and I really didn’t want to quit it. Tears falling down on my cheek as I tried to motivated myself and push through the ankle pain. I started to feel other part of my leg, like quad and hamstring started to hurt. I must have been compensated the ankle pain and totally messed up my running form, in result, put me in the world of hurt. I slowed down my run even more, and even take more walk break but I kept on going. At mile 15 – I broke down into tears. At that point, I was exhausted. The pain took so much energy out of me and I just want to be done. However, I didn’t want to quit so my stubbornness kinda took over. I took a deep breath and kept on running. At mile 16.5 – I had the pain pretty much everywhere on my left leg and I decided to walk the rest of the half mile. I power walked and finish the entire 17 miles. It took me about an hour before it actually hit me. I just did 17 miles. I twisted my ankle, tripped on a branch, cried, curse and yell but by golly, I did 17 miles. Thank you for everybody who tweet me. You have no idea how big the different it made. I woke up very sore and stiff. I did my usual stretched, iced and even soaked my legs in a cold water – but boy, I was in the world of hurt. My ankle swollen and my whole quad, hamstring and shins on that leg are in pain. Not so much on the shins, thanks to my compression sleeves. I was limping around and couldn’t even put my weight on that leg. I stretched more, and more and took ibuprofen every 6 hours. I was whiny and miserable. Then Allen White (t) told me to go out and run in a slow pace for 2-3 miles. WHA? I mean. Seriously? You want me to run with THIS ankle? I was desperate though as I really need to feel somewhat decent, so I figured – allright, let me give it a try. If it hurts so bad, then I stop. So I went to the gym and started to walk on the treadmill. It was bad the first 10 minutes but then, my ankle, quad and hamstring started to relax and I cranked the treadmill up and started to run. A mile went by and another mile and before long — I hit 3 miles without even feel any pain. I stepped off the treadmill and didn’t feel a lot of pain. I felt so much better! I’m so glad that I listened Allen’s advice!! I raised $1,425 total as of today! I’m so blessed to be have many generous and kind friends! I’m still far from my goal though, and still need a lot of help. Please visit my fundraising page at http://tinyurl.com/RobelMarathon to learn more about why I’m doing this. I did another 30 minutes walk around downtown. I’m starting to take a liking on this walk between my running days. It gets me out of the office and get my downtime workout in. I changed to my running clothes around noon, but never really made it anywhere. I worked through lunch and still have my running clothes by the time I got home around 8pm. I wasn’t a happy camper. I didn’t make it as a priority. Bad Yanni.